Here we go again, folks! It’s Turkey Day Trials, 2016! I’m going to invite the teacher to the blog for a moment and grace all of you with a brief history of the tradition. Turkey Day Trials dates all the way back to November 2010 with culinary experimentation to prepare for the most anticipated foodie day of the year. It started with prepping for the first Thanksgiving I prepared, lead to grocery store meltdowns, microwaved turkey breast, Kindergarten Turkey cooking (ironically, the frustration of being volun-told to cook for an elementary school “feast” taught me how to make the best bird), appetizers and dips galore, berry mistakes, and finally, comfort food leftovers. There have been ups and downs, but all have been fun (except last year when I had the stomach flu and could barely scarf down the stuffing). So this year’s Turkey Day Trial kind of happened on accident. By my husband. Yes, credit is due where credit is due and Chef Robert II (Chef Robert I is my dad. And it’s pronounced Ro-BEAR by the way) came up with a most fantastic, keep in the fridge all season long, use on everything Pumpkin Butter. It’s really amazing. The other day, I just happened to add a bit of spice to that Pumpkin Butter and used it with some braised greens and mushrooms, making one of the best accidental Thanksgiving-worthy-yes-it-will-be-on-my-fancy-table-this-year side dishes ever. Yes, I said it – EVER. Sig (the dog) would disagree, but pumpkin by itself isn’t all that flavorful. It’s a little musty and calls for brightening. Sweetness and warm spices give pumpkin its quintessential autumn flavor, and in this recipe, water is added to turn the clumpy pumpkin into that silky, smooth, glazy texture fruit “butters” are known to embody. 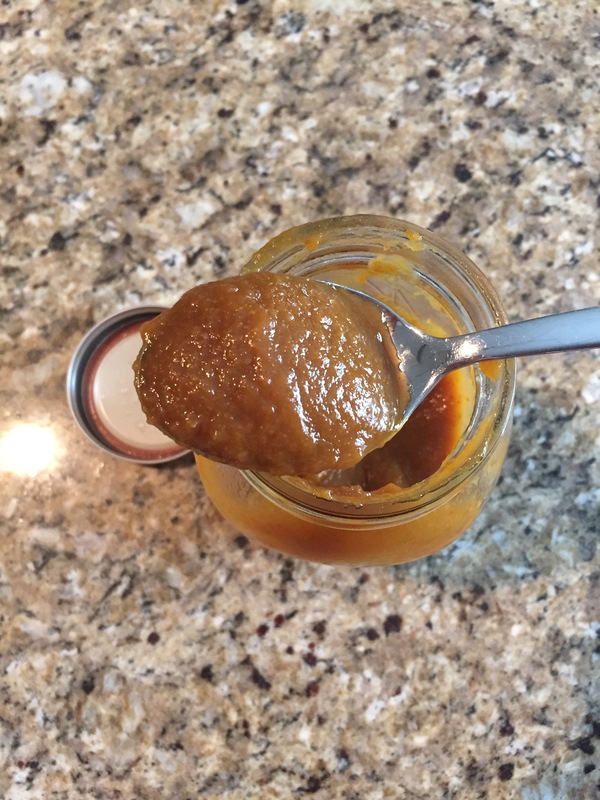 The Pumpkin Butter is easy: 1 can of pumpkin puree, 1 c of water, 4 tbsp sugar, ¼ c brown sugar, ¼ tsp each of nutmeg, cinnamon, and pumpkin spice. Mix all together in a sauce pan, and heat until the puree and the water have formed a smooth, silky consistency. That’s it! Now, I did mention that I spiced this baby up. To ¼ a cup of the Pumpkin Butter, I added 5-6 dashes of my favorite hot sauce: Tapatio. Honestly, the chili spiciness mixed with the sweetness and nutmeg-y goodness is a flavor I can’t get enough of. Granted – important note from Chef Robert II here – if you are going to use this Pumpkin Butter in coffee for an excelled Pumpkin Spice Latte, please omit the Tapatio. That would just be silly. So, onto the Turkey Day Trial side dish. Southerners loooooove their braised greens. Collards, actually, and I just can’t jump on that bandwagon. This isn’t for lack of trying – I’ve had collards every which way. But I simply do not like them, Sam I am. But, in an accidental mix up of wild mushrooms and kale, a bit of sherry vinegar, plumped dried cranberries, and a drizzle of salt and honey, I found a sturdy cooked greens dish that could kick the chlorophyll out of those darn collards any day. Also, it speaks heavily to my Scandinavian roots and Pacific Northwest taste buds, so there’s that for the sake of full disclosure. Kale, basking in its endless superfood limelight, is softer than collards but still cooks well keeping integrity (it doesn’t disappear like spinach) and offering a bit of sweetness. The mushrooms, oh the mushrooms, when those buggers are cooked till they just can’t be cooked anymore, they are amazing. Browned, nutty, addictive; they taste like the smell of the woods next to the ocean after it’s just rained. It’s a trick I’ve learned from my mom – let the mushrooms be. Well, my mom and Paul McCartney. Then – wait for it – I drizzled the Spicy Pumpkin Butter over the greens. I turned that one dish into a couple different things (Thanksgiving leftover ideas coming! Hint hint, wink wink!). I poured the greens on top of creamed barley for an earthy grain bowl, and I also pulled out a breakfast by shmearing some cream cheese on toast, topped with the greens and pumpkin butter, then “garnished” with a fried egg. Again – delicious. Time is running out on Thanksgiving countdowns, but luckily these gems are no fuss. 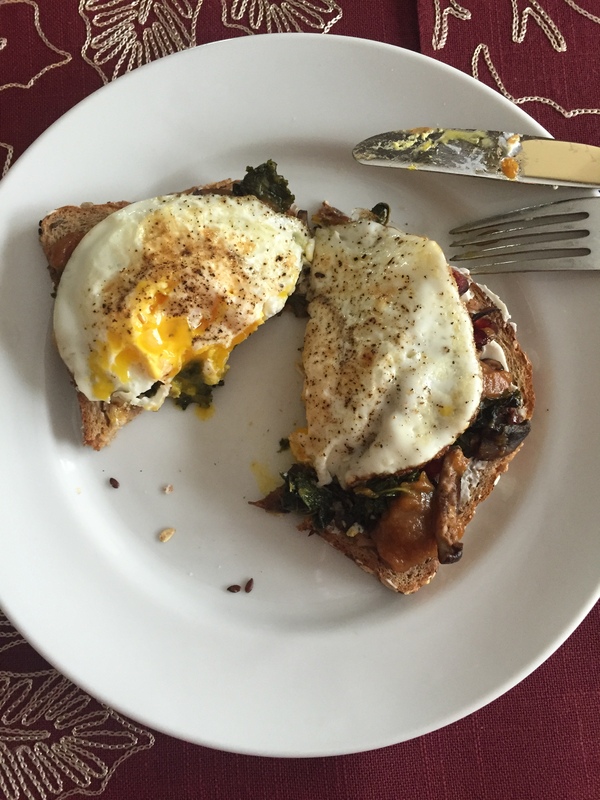 Rob’s Pumpkin Butter and my Mushrooms and Kale are perfect for your holiday feast. In a large sauté pan, melt the butter over medium heat. Add all the mushrooms and DO NOT yet season. Stir the mushrooms, let them absorb the butter, and then finally release their own juices (without the help of salt). Once the mushrooms start to caramelize, lower the heat to medium-low, and stir occasionally, letting the mushrooms brown, and then brown some more. Once they are fully caramelized (and considerably smaller) lightly season with s&p. Turn up the heat to medium, and pour in the sherry vinegar to deglaze the pan. Once the vinegar has reduced to almost gone, add in the water and the kale. Season with a bit more s&p, nutmeg, and add the cranberries. Once the kale has cooked (it will wilt a bit, still look wrinkly, and have a dark green color), and the cranberries have plumped, turn off the heat. Drizzle over the honey, and serve. Sometimes, just silly things happen in the kitchen. Like when I went to strain a sauce and acting on habit, strained it down the drain. Or when (and this is from my mom’s perspective) I do a little kitchen jig when the food I make is good. Or spicy. Well, the other day, as a part of my Turkey Day Trials, another mishap came about that still has me giggling. When Rob and I lived in Oregon, for a treat we would go for a cocktail and appetizers at the lounge at Bandon Dunes. We would dress up Pacific-Northwest-Golf-Club-fancy (yes that is a real fashion category) and watch as the cold-to-the-bone expert golfers would finish up the 18th. It was a little bit boushie and out of our Coos Bay ordinary, and we always struck up conversations with the most interesting (and sometimes famous) people. It got to a point that “our” bartender would put in the usual orders when he saw us walk in the door, and a few minutes later our Blue Cheese Chips were fragrantly awaiting our devour. The bowl of freshly-fried potato chips always went down quickly and shook off the lingering chill from the constantly-present coastal winds. But what always added to our Bandon experience was driving by the cranberry bogs on the way to the golf resort. I’d always strain my neck to see what stage of growth the cranberries were in, and harvest was always the best time. Stretching fields of red bogs, like giant ruby blankets against the green pines, the floating berries were sucked up into a tube and then shot out like miniature cannon balls into a truck, ready for processing and distribution. This water-powered firing of small, red fruit usually marked the autumnal season, signaling Thanksgiving was right around the corner. So this year, I paid homage to the cranberry by making an irresistible cranberry relish – one that puts even the coveted, jellied amazingness to shame. 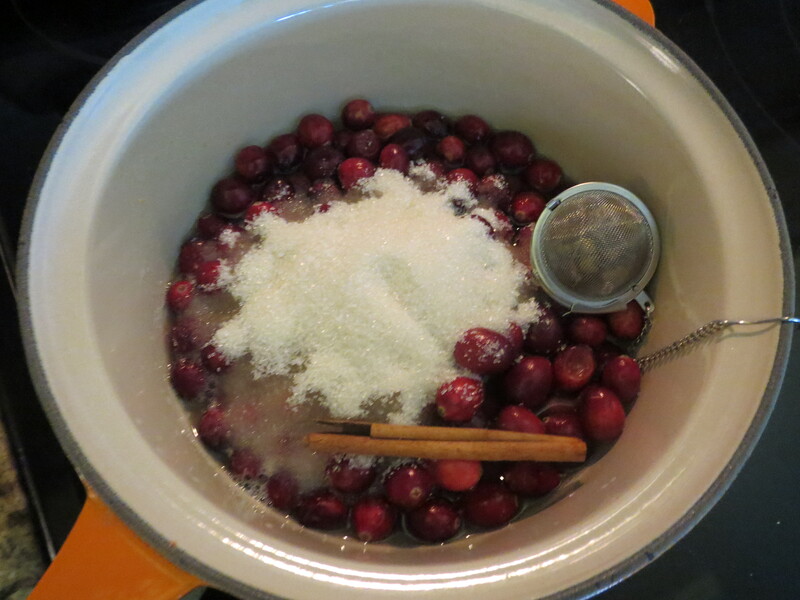 By simply taking 1 quart of fresh cranberries, ½ c sugar, a bottle of strong ginger beer (I like Reeds), a 4-in stick of cinnamon, a pinch of salt, and (here’s the kicker), a tea infuser of chamomile flowers, you will end up with a reduced, naturally pectin-infused bowl of beautiful, fragrant, and more-than-tasty cranberry relish. The trick is waiting until the boiling bubbles are shiny and slow-to-pop in the pot, almost like preparing a jam. After the relish is cooled, it will be thick yet spreadable, sweet yet tangy. Simple perfection at the Thanksgiving dinner table, or just the everyday autumn and winter breakfast spread. So what was so silly about making this relish? The fact that in my first batch (a major mishap), I added a bit of liquid, then a bit more, then a bit more, each time expecting the berries to be covered and give me a culinary visual of the accurate liquid amount. And after all those days watching the bogs, I completely forgot that… cranberries float!!! No matter the liquid amount, the cranberries will never sink in the pot like they do with other jam fruit. So stick with the recipe – it works, thanks to my silly mistake. Have a very happy Thanksgiving! Enjoy with food, love, laughter, and memories! Don’t “they” say that most horrible emotional crises happen during the holidays? Like, if there was ever a time to yell, stomp, scream, cry, and down-right pout, now would be the time? Of course these tantrums happen to sneak up at inopportune times, taking only one, very small piece of straw to break the camel’s back. It seems quite paradoxical, actually, a grown-up having a fit among a-bit-too-loud cheery Christmas songs and smiling cut-out advertisements exemplifying holiday spirit. Well, I’m glad to say that I did not yell, nor stomp. I did not scream. And while the I-really-am-trying-to-have-a-good-time-but-my-face-says-otherwise pouting did inevitably lead to leaving tear stains on Rob’s flight suit, the wonderful workers at the Home Depot Garden Center would probably classify me as one of “those” people. Remember that wonderful Christmas tree farm in Oregon where we got to cut our own tree? It was always cold, festive, pine-y, and everything you would imagine out of a Courier and Ives picture-scape. Rob did NOT cut the tree the first year (leading to much teasing on my end), and the second year Rob so acutely DID cut the tree, thus having it land perfectly on me. Payback is, well, what I was when I teased him endlessly I guess. In all efforts to make the Christmas tree shopping situation feel more festive, Rob reached into one of his many, many pockets, found his flight knife, and started tearing into those trees like Paul Bunyan. One by one, he vehemently sliced through twine, letting each tree open, boughs falling with ballet grace and exuberance. The free-ing of the trees almost let out audible sighs and I could swear a couple started whispering, back to the dirt or bust! I watched as the lady at the checkout eyed us with a suspicious who-are-these-hippie-freeing-tree people look on her face. A couple of customers walked up for their own tree, but saw the rally and turned the other way. Rob, at this point, was hidden among the full figured pines, and I stopped him from cutting another. He knew that would sell me as my last name means “Grove of Oaks.” It worked. Sap and pine-needle dusted, and a bit sweaty, Rob and I purchased our Home Depot tree and tied it to the roof of his car. At home, just like we would do in Oregon, we made some nibblies, had a cocktail, and put up our tree. It is a gorgeous tree. In fact, I think it could give the big ol’ pines in Oregon a run for their money. Today, our tree is decorated, fragrant, sparkly, and beautiful. We even positioned it in front of the outlet connected to the wall switch. So rather than crawl under the tree and risk blindness and choice words from pine branch poking, we simply have to flip the living room switch for twinkle light galore. To celebrate, I created a cocktail perfect for the holidays. It is festive, fun, tasty, and perfect for this time of year. 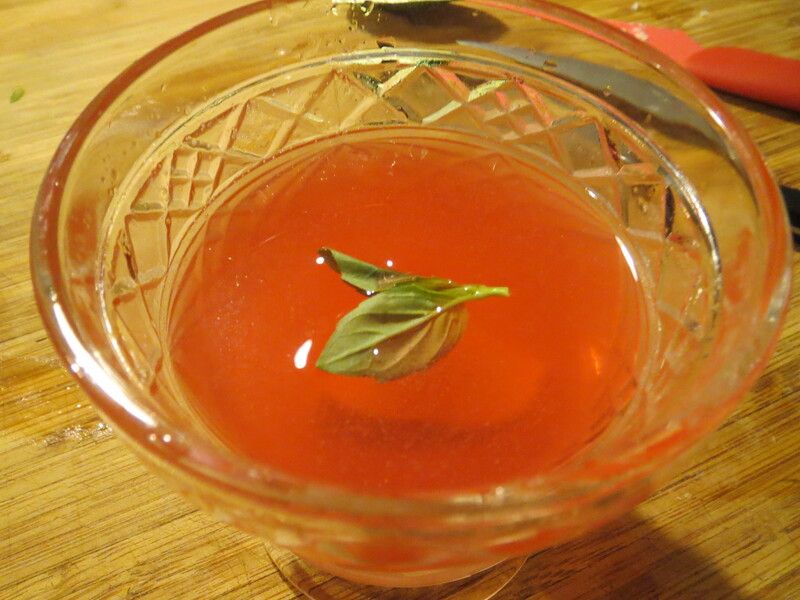 The best part of this cocktail is the simple syrup: sugar, fresh cranberries, water, basil, and fresh ginger. 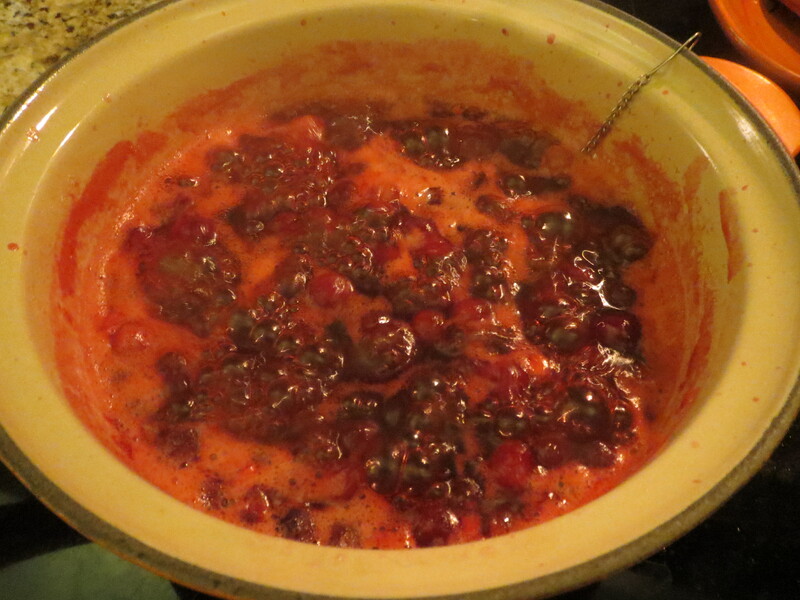 It simmers until all the cranberries pop, pop, pop, and the syrup gets thick and rich. But that’s not the best part! After straining the mixture, the syrup leaves behind a beautiful blend of thick, sweet, stewed cranberries, better than most chutney I’ve ever had. In fact, we dolloped it atop some super sharp cheddar cheese and an apple slice, and had a perfect hor’dourve to match our drink. Like every other Christmas that Rob and I have shared together, this one started off in its standard way: a funny story to tell, and a libation with which to retell it. Enjoy the holidays, and enjoy the chutney and cocktail! Heat over medium-high heat, and give the mixture a stir, until all the sugar has dissolved. Let it sit and bubble, until all the cranberries have popped, and the mixture has thickened (this will only take about 5-7 minutes). Using a fine mesh sieve, strain out the syrup, and keep the solids – discarding the basil leaves – as a wonderful chutney. 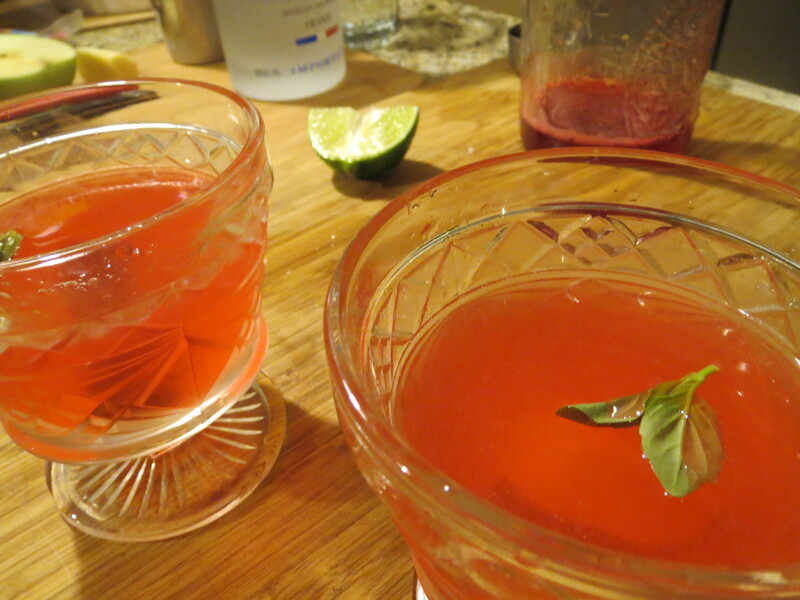 Combine 2 tbsp of the cranberry syrup, 3 oz vodka, juice of ½ a lime, and some ice into a shaker. Shake until cold and mixed, and strain into a martini glass. Serve with a garnish of lime and a basil leaf.